Like most stories worth telling, there is a point. Several, in fact. On 11 August 2009, I and a bunch of friends from Japan encountered an injured humpback whale in the waters of Vava'u in the Kingdom of Tonga. It was just the sort of day for a tragedy. The skies were grey and overcast; the seas a drab, murky mess; visibility both in and out of the water low; the prevailing mood "depressed". Sighting whales was, of course, the reason we were out and about, so finding a pair of approachable whales was a good thing. Or so it seemed. Not long after entering the water, we noticed that something was wrong. With poor visibility, it was difficult at first to pinpoint precisely what that "something" was, but once the whales passed within close proximity, it was obvious. One of the whales was hog-tied. Its pectoral fins were bound to its side, and the rope or netting had sliced into the animal's body. The injured cetacean was weak. It couldn't swim properly. It was covered with parasites. And there were sharks circling…waiting, no doubt, for an easy meal. The scene was heart-wrenching. Despite my desire to stick with the whales, I pulled everyone out of the water in short order. Several large bronze whaler sharks shot up at high speed from the murky depths and buzzed us. The conditions were ideal for sharks on the prowl, not so good for land-lubbers flopping around at the surface. Back on the boat, we followed for some time, long enough to see that the uninjured whale stayed with the injured one, perhaps protecting it, perhaps hoping for a miracle. Difficult to know for sure. The injured whale was a female. It was, without question, about to die. As shocking and depressing as our experience had been, the real story took place after we got back on land. News of our encounter spread quickly through the community. By the time we washed up and went to dinner, many people in town had heard about the encounter, though…as is often the case…the specific details of our experience seemed to become more distorted with each re-telling of the tale. Several people, expats who live and/ or work in Vava'u, informed us that they knew who was responsible for the doomed whale's plight. To elaborate, they told us that it was the practice of some villages in the area to use nets to catch sea turtles for food. They further informed us that many of the expats had been trying to teach the locals about why turtle nets are a no-no. 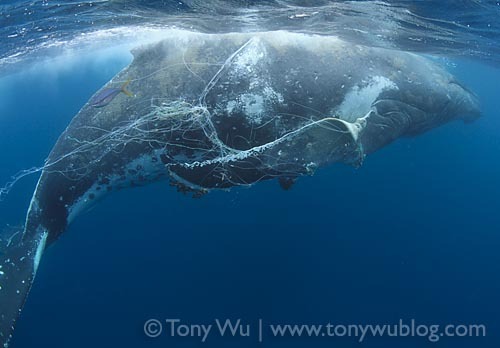 Slaughtering endangered sea turtles and ruining reefs was bad enough, but now…it was obvious that someone's turtle net had killed a humpback whale! This, of course, was an unforgiveable transgression. Person after person agreed, and a bit of a mob mentality developed. Emotions escalated. Indignation permeated. Within short order, several people asked us to give them copies of our photos so that they could use the images to educate the locals. Actually, "asked" doesn't convey the correct connotation. "Demanded" is more accurate. There were, of course, some polite requests, but one woman (a person we hadn't previously spoke with) in particular became quite agitated. She insisted that we hand over our photos because, well…it was for a "non-profit" cause. Emphasising repeatedly that her demands were for a "non-profit" purpose, she produced a USB memory device and stuck it in one of my friend's faces saying "Put the files on this" in an emphatic tone. Yes…she stuck a memory device in his face and demanded that he give his photos to her. That very instant. Or else. She pouted and stammered a few times to underscore how serious she was. Given that we hadn't even had time to look at the images ourselves and were still trying to process what exactly we had witnessed, I didn't think it appropriate to hand anything over, and I particularly didn't think that we should be "educating" the locals quite just yet. We declined the requests several times in a graceful manner, until that particularly demanding woman became so obnoxious and unbearable that I set aside all pretence of polite social discourse and put an abrupt, unambiguous stop to the insanity. The audience dispersed. In the ensuing days, I had time to examine the photos closely. I went out of my way to ask about turtle nets. I tried, in vain, to set up a meeting to see an actual turtle net (seems like they're not that common). I showed fishermen (both local and expat) the photos and asked their opinions. Eventually, I concluded that the net was not a net. It was a longline. At 100% magnification, the metal clips characteristic of longline fishing were obvious in many of the photographs. The fishermen I consulted agreed. This, of course, made much more sense. Humpback whales travel long, long distances in the open ocean. Fishing fleets set longlines in the open ocean. Villagers, to the extent they use turtle nets, wouldn't be using them in open ocean. They would more likely use them in coastal waters. The chances of a whale getting entangled in an industrial-strength, open-ocean longline are much greater than in a handmade net set near the coast. Everyone was upset about the tragic, pointless death of the whale. Rightly so. The people who became distraught and unreasonable were good people who just got carried away. It happens. But I learned some things about human nature and behaviour from the experience. Things I wanted to jot down so I don't forget, and also to guide my own conduct if I should ever again find myself in a similar situation. 1. Don't ever assume anything. Get the facts. Think things through. Then draw conclusions. The expats in this story assumed, with zero evidence, that local villagers were responsible for the death of a humpback whale. They were, in effect, ready to lynch the locals for killing the animal. The problem is that they formed their views based on emotion, not fact. Longline fishing is the practice of rich, industrialised countries. So if someone were looking to assign blame, it would be the expats and tourists (me included) from rich industrialised countries who were more closely associated with the whale's death than the local villagers. Discouraging the use of turtle nets might be a valid issue. But it had nothing…absolutely nothing…to do with the plight of the poor humpback whale we encountered. Person after person piled on and agreed that local villagers were responsible for the death of an innocent whale. The thing is, of the people tossing around accusations, none…not a one…had seen the whale in question. Herd mentality is bad, and it's much too easy to get swept away in the moment if you cede self-control and good judgement to a mob. 3. Using the term "non-profit" does not mean you can demand anything you want. The woman who was so indignant that we didn't immediatley hand over all our photos as soon as she mentioned the term "non-profit" was clearly under the impression that using the term "non-profit" gives you a license to steal. Yes, demanding property that isn't yours is theft. I encounter this mentality with disturbing regularity. Many people seem to believe that simply being a non-profit entity, or worse, just stating an intention to undertake something in a "non-profit" manner entitles you to demand stuff for free...especially photographs. The woman in question owns a yacht, along with her husband. Had I demanded the unconditional and immediate use of her yacht for "non-profit" research, I'm sure she would have balked at the suggestion. And yet, she was, and perhaps may still be, entirely convinced of her right to appropriate other people's property simply by labelling her demand as "non-profit". That, in my book, is a "non-starter".